In the decisive match against South Korea, Germans displayed their worst performance of this World Cup 2018 as they were knocked out of the World Cup. In the 1st half, unsurprisingly Germany dominated the possession but South Korea remained pretty adamant in their defense. On the other hand, South Korea also couldn’t score any goals as the 1st ended with the scoreboard being 0 – 0. The same story repeated itself in the 2nd half of the match as Germans were constantly failing to score a single goal. The match came in its last moments and even then Germany were unable to score. On the contrary, South Korea didn’t waste this opportunity. 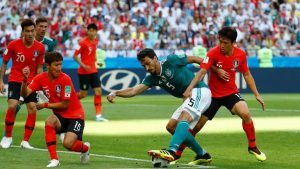 As, Kim Young Gwon and Song Heung struck in a periodic fashion to knock out the defending champions, Germany out of the FIFA World Cup 2018. Wow! Germany fans unuh alright? This World Cup has been one of the most unpredictable ones ever! Germany’s sensational exit from the #WorldCup has drawn comparisons to The Undertaker’s shock elimination from the #WWE Royal Rumble in 2002. In a dramatic turn of events, Sweden ended Mexico’s winning streak to qualify for the next round as Germany was knocked out by South Korea. The first half of this match experienced a total of 19 shots which is the most in this World Cup 2018 so far. However, despite these attempts no goals were scored in the 1st half as it ended with the score being 0 – 0. In the 2nd, half, Ludwig Augustinsson put Sweden in the lead with a superb left foot volley. This lead was doubled at the 50th minute by Andreas Granqvist who scored a successful penalty to make it 2 – 0. Things didn’t get better for Mexico as 12 minutes later, Edson Alvarez scored an own goal making it 3 – 0. Mexico tried to score a consolation goal but Sweden’s defense was too good for them as they lost the match and Sweden qualified in the next round. What we’re not about to do is blame Edson Alvarez though, every goal that was conceded, Edson had two men on him. He received zero help from Layun all game! Broke down when I saw Edson Álvarez crying at the end of the match cause of the own goal he scored. I’m carrying that with me forever. Followed him the whole time with my eyes until he went through the tunnel. Switzerland were favorites to win this match as Costa Rica previous record being win less against a European side in the World Cup. In the 1st half of the match, Switzerland took the lead as Blerim Dzemaili who struck the ball cleanly into the nets to make it 1 – 0. Costa Rica couldn’t equalize as the 1st half ended with Switzerland in the lead. 6 minutes into the 2nd half, Kendall Watson’s brilliant header equalized the scoreboard and the score was now 1 – 1. But, Switzerland didn’t lose hope and Josip Drmic scored at the 88th minute to put his team back in the lead. Switzerland would have won this match, but their luck ran out as their goal keeper conceded an own goal and the match ended in a draw. That was close for Switzerland to lead again as Josip Drmic header just rattles the post. Brazil remained unbeaten in their group matches as they won their last match against Serbia to advance into the next round. Paulinho put Serbia in the lead with a beautiful one touch to make 1 – 0. Serbia couldn’t score in the 1st half as it ended with Brazil in the lead. The 2nd half was the same story as Thiago Silva struck a beautiful header to net the ball into the goal post and double Brazil’s lead. Brazil dominated possession and didn’t allow Serbia to score a single goal as Serbia ended their World Cup campaign with a loss. players like paulinho are only so good because they grew up in the slums and had years to practice. if jon jo shelvey wasn’t grafting his arse off in a chippy 5 nights a week to afford a 10 top up on his sony erikson ww80i he would easily be the better player. 1 Jesus moves between the #Srb‘s CBs, moving LCB out of position. 2 Kolarov[LB] is too much concentrated on Willian, do not covers centrally the hole left by the LCB & there is a central schism in #Srb defence. 13 years ago, Thiago Silva nearly died of TB in a Moscow hospital, and was apparently rescued by Russian doctors. He spent nearly 6 months alone in a room, fearful that he wouldn’t be able to play football again. Coutinho is getting all the plaudits for Brazil so far (rightfully so) but it has to be said that Thiago Silva has been absolutely superb. 3 impeccable performances in the group stage by Thiago, who is truly looking like he’s back to his best. Previous articleWorld Cup 18 – Allsportspk Russia Exclusive: Fans Celebrating in a Bus!